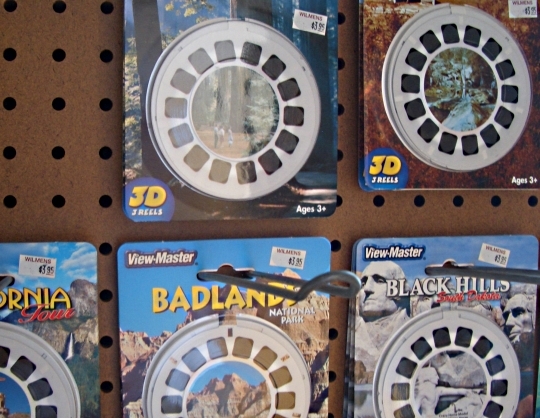 I felt a wave of nostalgia when I came across the View-Master this summer in an Amish shop. Remember this classic toy? As a child of the 80s the View-Master was still kicking in my youth, and I remember being fascinated by the 3-D effect created by the simple stereogram technology. Today’s kids, of course, might avert their eyes momentarily from the XBox to smirk at this amusing relic before returning to blasting pixellated aliens or scoring electronic touchdowns. Hey, and I don’t know that I can blame them. The View-Master is definitely a toy of another era. It’s a one-trick pony, lacking the bells and whistles and intense experience of today’s amusements. 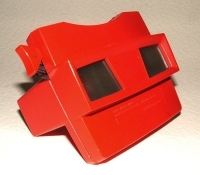 But when you don’t know a thing about the XBox, the View-Master was a pretty cool little gadget. The View-Master is another example of a toy which has fallen out of favor in mainstream America but is still alive and thriving in Amish society. The shop where I found this one was chock full of 3D reels like the ones you see here (besides these I saw disks for Covered Bridges, the Statue of Liberty, Italy and the US Presidents). We’ve discussed Amish and board games before; Amish are also avid players of card games. You can find simple wooden toys in Amish homes and being turned out of Amish woodworking shops, both for the Amish and for English parents looking for throwback good fun. And I have to bet that Amish children are some of the most adept at conjuring joy from toss-away items like boxes and cans. What are your View-Master memories? What other classic toys have we forgotten? 33 responses to Remember the View-Master? Love the View Master! It took me places and let me see things I could not experience otherwise. I have them for the grandchildren and the younger ones still enjoy them! Thanks for all you do in this web site Erik! Appreciate that amy jo! Great to hear the View-master is still up and running. OMG!!! Yes, I remember them — and they were in the 1950’s too, (now I’m telling my age), and I would sit for hours looking at all of my reels of places to see, cartoons, etc…..can’t remember what happened to it, though — My kids also had them, (in 1970’s)and they thoroughly enjoyed them!! Those were the days, with so many wonderful toys — none electronic either!! Board games were also a very popular item — especially on rainy days, where you couldn’t get outside to play! YEP — Those were the days! I have a View Master !!!! I have the 3D reels of the Amish. I bought the reels on ebay so I had to look all over to find a View Master. I found that in a rummage store a couple of towns over. The reels cost me more than the View Master did, but I do enjyo having them. When you look at the Amish on the 3D reels and look at the Amish today, things have changed a bit. The Amish have become a bit more modern. I still have my Viewmaster and the reels. I got mine for Christmas 1959 when I was six years old … oooppps told my age too! They go back even further. One of my sisters also had one that she probably got in the 1940s as a Christmas gift. My daughters had them, both in late 20s and early 30s now. I have the Amish set, purchased on one of our many day trips to Lancaster Co. Do you ever see the stereo viewers in Amish homes? The ones that are hand held … you insert a card with two identical photos side by side and look through the lenses. They were popular 100+ years ago and quite collectible. I guess that I need to dig out that old Viewmaster and put it on display along with all of our other “antiques”!!! Now that makes me want to go downstairs and see if we still have our Viewmaster!! I had one when I was a kid and got one for my own kids (who are now early 20s). We went to a restaurant one time and they had one on each table showing all the different desserts they offered. It was such a cute idea but probably long gone by now. Boohoo. Wow. I could really see something like that being a hit, a nice extra touch, in a retro-themed restaurant. That would be special. I got one for Christmas one year and spent hours with it! But alas, don’t have it anymore — too many younger siblings, I guess. Actually some children enjoy them today, even with all the other exciting toys around. My sister has one and I’ve seen children have fun with it not so long ago. I had a view master when I was a kid and really enjoyed it. I have a little boy I need to get a gift for Christmas. This sounds like a good idea. Hopefully they are still available. Thanks Erik for all you do for this web site. I don’t leave a comment very often but I read it everyday and do really enjoy it. I appreciate you taking the time Jane. I guess I got lucky and picked the right topic today! Really, I was almost blown away when I saw a whole wall full of these 3D reels. I hadn’t seen that many in one place probably since the 80s, if then. We will have our view-masters! Love them, and the reels. It has been awhile since we had them out, but our nieces and nephews loved looking at the reels we had a few summers ago. Simple things are the best! We will have our view-masters! Love them, and the reels. It has been awhile since we had them out, but our nieces and nephews loved looking at our reels a few summers ago. Simple things are the best! Yes, I certainly remember them! I’m a child of the ’50s, but I had two older sisters (born in ’30’s & ’40’s), so I got their hand-me-downs, including the old, BLACK VIEW-MASTERS (my kids had the red ones in the ’70’s & ’80’s). We had a shoebox full of the reels,, all sorts of subjects! No batteries needed, just a source of light (a sunny window, lamp, the sky). Quiet (except for the occasional “oohs” and “aahhs” from the child doing the viewing)—I might still have one somewhere in the basement. I also have my family’s old (and rare, I’m told) 3-D camera. Yes, it took 3-D pictures, which were then mounted into slides (two celluloid (?) images, side by side, maybe an inch or so apart). They could be viewed in the old battery-operated viewer (which I also have). I have several boxes of old family 3-D photos from about 1953 to 1958. Then, when I met my husband, he was into cameras & photography, and he took some 3-D photos of me/us in the ’70’s and was still able to get someone to mount them the old way—I don’t know if they could do that today. The only problem was you had to look at the photos one viewer at a time—passing around the viewer. It took a while, but was very much fun, and still is! With all the interest in 3-D TV, movies (no, you didn’t have to wear special glasses for the 3-D effect for the slides), I wonder if the camera has gone up in value? I’ll have to investigate–one more thing to do if/when I retire! Yes, I remember the view-master. My God, it’s been a while since I’ve seen one. I had one growing up in the ’70s. Wow, going by comments looks like there is a lot of enthusiasm for this classic. The next step might just be the Amish-crafted View-Master, in oak, cherry, or walnut, and your choice of stain 🙂 I’d sign up for one! I still have my “The Brady Bunch Goes to the Grand Canyon” reels. Ahhhh….memories! Darlene that sounds like it’d be a bona fide Ebay treasure. It also makes me think they made a reel for everything. I believe I was reading they produced something like 1.5 billion of them. I seem to recall entire single reel stories featuring well known, and might I add timeless, cartoon characters in the 1980s, of course I seem to recall the Flintstones and the Muppets for whatever reason. We had loads of reels in my house. I remember just liking to look at the tiny little images on their own without the view finder. I think its fair to say that the technology goes back, in theory, to the nineteenth century with an even more primitive form of the view finder using twin images of either people, buildings or scenery from all over the world. But I forget that they call it, same idea but without the reels. PS, did anyone have trouble with their internet, particularly things like google on November 29, 2011? Shom I think you are right, there was an earlier tech but not sure what it was called. Boy if you were enjoying just the images minus the View-master you had a sharp pair of eyes! On your last question, I didn’t have any unusual issues with my net that day. Reading all of your posts, I’m feeling really sorry I didn’t keep ViewMaster. I probably got it for Christmas around 1950 or so. I’m trying to remember who reels we had but just can’t remember for sure. I do remember that I often thought “Wow!” when I watched one. I can still hear Henry Fonda saying “GAF Viewmaster” on the old commercials! Any idea where one might find a ViewMaster – outside Amish country? Where to buy a View-Master? Welcome and glad you decided to dive into the Amish America pool here! 🙂 Where to find one now? That is a great question. I’m guessing online, but haven’t checked. I’m also assuming they’re not as common in toy stores, but I don’t have kids, so haven’t been down a toy store aisle for some time! It’s wonderful to see all the memories people share connected to this one simple, yet in its own way magical, device. Erik doesn’t NEED kids; he has US! I never had one, but always wanted one. My brother had one, but only let me play with it a couple of times. I think he had Pooh reels and maybe bugs bunny? You can still get Vie Masters! I just went on the Toys R Us website and typed in “View Master” and found they still have them. Most items say “Fisher Price”, and some are kits (Disney characters like “Disney Princesses”, also Fisher Price Sponge Bob). They also have a cool looking round case (with a handy hook) to store your reels in! It seems like most View Master viewers are in kits, but they do show Cinderella reels as an individual purchase. Thank you for the toysRus info Alice Mary ! Cool! Personalized View Master reels! I just found this website for a company that will make personalized reels—seems like they’re a way to advertise (business) in 3-D, cheap! Try out the link below, or just image3d.com and see what I mean. (I didn’t investigate any further than the first page…) They should certainly do more of the Amish…for those of us who don’t visit Amish areas much! and the full ad was for Viewmaster available through the store. only Viewmaster in this ad. It must be popular among popular among people who read The Budget. Leave a reply to Remember the View-Master? How do the Amish help Haiti?